A luxury copy of a popular devotional manual and hymnal. First printed in 1685, Rittmeyer's "Heavenly Repast of Joy" enjoyed lasting success. The author (identified in this edition at the end of the foreword) was a preacher from Helmstadt. All editions were illustrated, using the heart motif whose origins lie in the 16th-century religious emblems of Antoine Wierix's Cor Iesu Amanti Sacrum. This edition appears to be the first illustrated by the Leipzig engraver Johann-Benjamin Brühl (1691-1763) (the previous edition from this press, published in 1628, had engravings by A. Reinhard). The engraved title shows Jesus dining with the apostles, surrounded by humble onlookers. The frontispiece is a Crucifixion, with mourners below including Old Testament personnages (Adam and David), each identified by an engraved caption. The engravings show the heart as a symbol of the soul, and its progress under the influence of the infant Jesus, whose exact actions are succinctly described in their titles: Jesus knocks on the heart (containing a closed door); holding a lantern illuminating rats and scorpions, Jesus examines the heart; Jesus, sweeping, cleans the heart, etc. Engraved above each heart vignette is a Biblical quote, and below a German verse caption. The work was a staple of the Stern press in Lüneburg from 1728 to the late 1760s. Known as galuchat in French, "sharkskin" was often in fact rayfish skin. 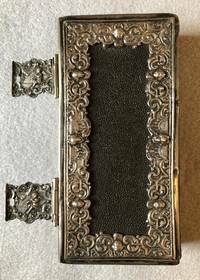 It is far more durable than the shagreen used in 19th-century imitations, and was used for luxury bindings in Germany, often in combination with silver onlays. This edition not found in OCLC; KVK refers to an entry in the Union Catalog Southwest Germany, location not given.